tb - Yes, I wondered when or if that would ever come up. It hasn't. We do more and more flat sills low to the floor - 1/2" max height by request. However, that makes a walk off rug impossible at the door. Once they hear that, they want the high threshold. 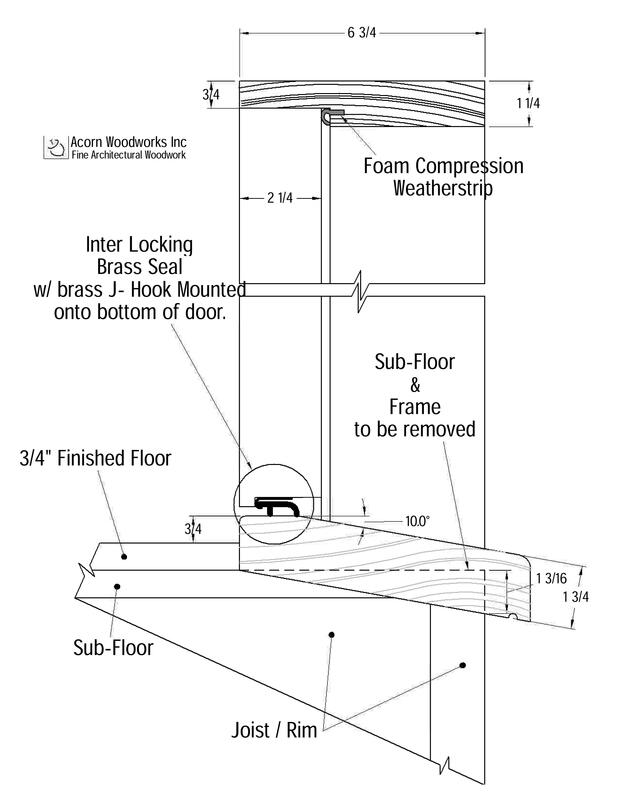 Tom - Run your exterior stoop materials right into the frame opening and a 7-8" wide sill. You will have jambs out there with no sill under, but they are sitting in/on something, so paint the ends with epoxy. I do my epoxy and finish alittle different so you don’t have it “chip” as David says. I thin West System epoxy with acetone to allow the epoxy to soak into wood, rather than just lay on it. This does two things, it acts as a good preservative and it hardens the wood. While white oak is both hard and a good weather resistant wood, the epoxy makes it that much better. The down fall is epoxy is UV sensitive so you must topcoat with something to block the sun.